Are you planning to have a party to celebrate something special? Maybe a milestone birthday is coming up, or a family reunion, and you are looking for a unique venue for the event. 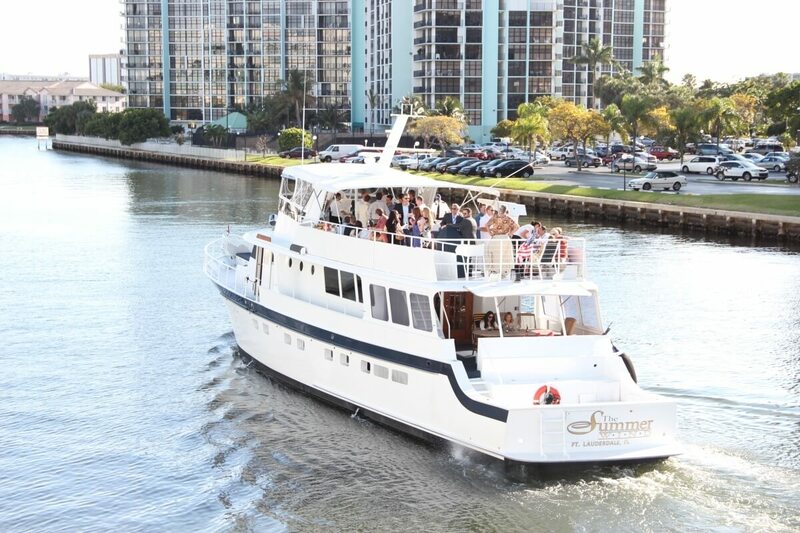 Charter One’s Miami party yacht charters are the perfect venue for any event, including yours. We offer so much more than a catering hall or room in a hotel ever could. You and your guests can experience the freedom of sailing along the beautiful Miami coastline, enjoying panoramic views and sunny skies. Don’t be landlocked in some stuffy room when you have Miami yacht charters at your fingertips. We have been in the service and hospitality business for many years and we are experts at hosting all kinds of events like: weddings, corporate events, product launches, quinceañeras, bar mitzvahs etc. Our luxury yacht charter Miami excursions provide the very best in amenities, cuisine and service. Your guests will love our Miami party yacht charters and so will you. Our talented event planning team is ready to assist you in planning all the details of your party. Once they have your vision for the party they will begin to develop and execute your event. You do not have to do anything except send out your invitations! We do all the work, leaving you free to attend to other matters. If you would like to select a theme for your luxury yacht charter Miami, our team will devise a great party around it. We work with independent vendors who supply important resources that can make your event extra special. You can select: tableware, decorations, live band or DJ, entertainment, a custom cake, photographer/videographer, gifts/favors, floral arrangements, ice sculptures and so much more. Some of the themes we have hosted include: casino gaming, masquerade ball, dance party, mystery night, romantic date night, sporting event and more. You and your guests will have a blast on a Miami yacht charters adventure. After you have drawn up your guest list you can select which one of our gorgeous yachts is the best venue for your party. Our stunning vessel The Grand Floridian can comfortably accommodate up to 550 guests with formal seated dining for 240 guests on one deck. This 128-foot beauty boasts four decks that include a sun deck, a sky lounge and two aft balconies. Also included are a custom full-service bar, multiple dance areas, state of the art media capability, 13 HD TV’s, elevator service, and private staterooms with en-suites below deck. For a smaller, more intimate Miami party yacht charters event we suggest The Summer Wind yacht that can accommodate up to 65 guests. This regal beauty was once the private yacht of the famous Bacardi family and can serve as your very own private yacht for the day. The Summer Wind has 3 decks, a custom full-service bar, indoor and outdoor lounge areas, a swim platform and private staterooms with en-suites below deck. Have the time of your life celebrating in style aboard a luxury yacht charter Miami. To begin making plans for your next party contact Charter One today at: 954-771-0102. Looking for a Ft Lauderdale Yacht Rental? Give us a call!